British cruise line Saga Cruises’ ship Saga Pearl II ran into some trouble earlier this week. Literally. The small ship was being piloted by Port of Dartmouth Harbormaster Captain Mark Cooper when it clipped four yachts during a turning maneuver. No one was hurt during the incident, and the damage to the yachts was only superficial. Some people have reported that when the yacht owners saw how close the ship was, they began running in their pajamas from one side of the boat to the other in fear. Records from the accident are being collected to figure out exactly why the incident happened and what can be learned from it. Saga Pearl II has been operating for over 30 years and joined the Saga Cruises fleet in 2009. The small luxury ship weighs just over 18,000 gross tons and can hold 449 guests. In 2019, Saga Cruises will replace Saga Pearl II with a new build. 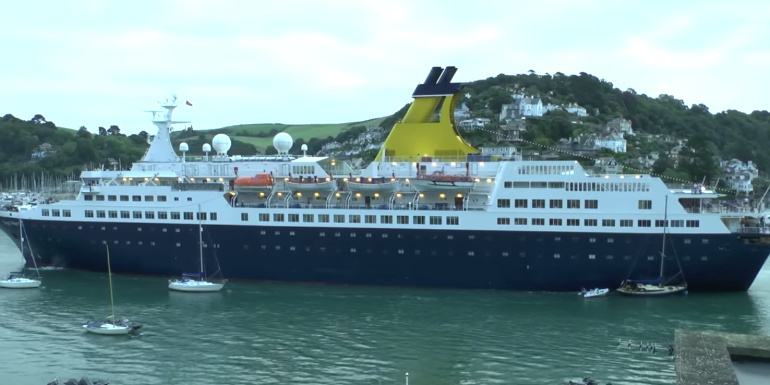 Her last cruise with the line will be in February when she embarks on a 54-day cruise from Portsmouth to South Africa. Have you ever sailed Saga Holidays? Try as I might I can’t see any ‘luxury’ yachts.